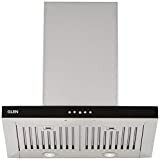 How to Select the best Kitchen Chimney? A kitchen chimney has become an important addition to a kitchen to ensure it remains clean and free from odor, grease, grime, and fumes. It also has functional benefits, as it makes it more convenient to cook food and spend more time in the kitchen. Besides, it can also provide protection to your tiles and various kitchen surfaces. The right chimney can help in creating fresh environment and can also add to the kitchen’s looks. Ducting/Extracting Chimney: This chimney works by sucking air and passing it through filters. The grime and grease in the air gets stuck to the filters and the air is removed through a duct. It can use baffle or mesh filter and needs plumbing installation. Ductless/Recycling Chimney: Ductless chimneys will have a motor and blower or fan. They works by using a grease filter for trapping grease and the air is passed through charcoal filters. Once the air is purified, the air gets circulated back. Air Suction Capacity: Select a chimney based on kind of food you prepare most often. An average home can do with a chimney with capacity of 400 m3 per hour. Your family size and volume of food prepared also affect this factor. Size: The size of the chimney depends on your kitchen’s size and the volume of food you prepare. They are available in sizes starting from 60 cm. Blower: If you want the chimney to work faster, choose one with more blowers. The type of food you prepare more often also affects this factor. The blower is responsible for removing gases and oily vapors from the kitchen. 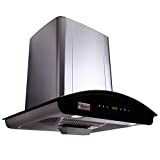 Auto-Clean Feature: Latest kitchen chimneys come with an auto-clean feature. if your budget allows it, choose this feature to reduce the maintenance time. Ducting: If you are choosing a duct-based chimney, it is best to channelize the duct through the shortest-possible route. The duct’s design should be created in consultation with your plumber or designer. The chimney’s appearance is also a factor in making the right choice. 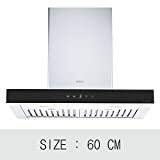 You should also evaluate the leading brands when choosing the best kitchen chimney. Glen: The brand offers kitchen chimneys with a wide range of features that also look elegant. They are powerful, require low maintenance, are more silent in operation, and easy to use. 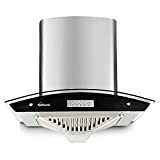 Bosh: The brand is known for its chimneys with standard designs, powerful motors, multi-stage back-pressure feature, long-lasting baffle filters, and advanced control panels. Prestige: This brand offers more contemporary designs with innovative features. Some of the best chimneys have the function of warming and melting hard-to-remove oil and grease from cavities. Kaff: This brand is highly valued in the market for chimneys which retain their cleanliness and oil-free form for longer. They also offer high level of smoke and dirt absorption. 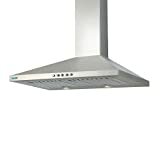 Elica: As the name suggests, this brand offers some of the most elegant kitchen chimneys. 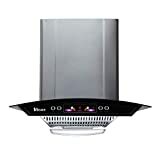 The chimneys have exceptional suction power and offer all the standard functional features. Besides these factors, you should also consider the warranty and price of the kitchen chimney. Look for a unit that is affordable and comes with longer warranty.